Handles univariate non-parametric density estimation with parametric starts and asymmetric kernels in a simple and flexible way. Kernel density estimation with parametric starts involves fitting a parametric density to the data before making a correction with kernel density estimation, see Hjort & Glad (1995) . Asymmetric kernels make kernel density estimation more efficient on bounded intervals such as (0, 1) and the positive half-line. Supported asymmetric kernels are the gamma kernel of Chen (2000) , the beta kernel of Chen (1999) , and the copula kernel of Jones & Henderson (2007) . User-supplied kernels, parametric starts, and bandwidths are supported. An R package for univariate kernel density estimation with parametric starts and asymmetric kernels. kdensity has built-in support for many parametric starts, such as normal and gamma, but you can also supply your own. It supports several asymmetric kernels ones such as gcopula and gamma kernels, but also the common symmetric ones. In addition, you can also supply your own kernels. A selection of choices for the bandwidth function bw, again including an option to specify your own. The returned value is callable: The density estimator returns a density function when called. A reason to use kdensity is to avoid boundary bias when estimating densities on the unit interval or the positive half-line. Asymmetric kernels such as gamma and gcopula are designed for this purpose. The support for parametric starts allows you to easily use a method that is often superior to ordinary kernel density estimation. First you need to install the package devtools from CRAN. From inside R, use the following command. This installs the latest version of the package from GitHub. Call the library function and use it just like stats:density, but with optional additional arguments. Kernel density estimation with a parametric start was introduced by Hjort and Glad in Nonparametric Density Estimation with a Parametric Start (1995). The idea is to start out with a parametric density before you do your kernel density estimation, so that your actual kernel density estimation will be a correction to the original parametric estimate. This is a good idea because the resulting estimator will be better than an ordinary kernel density estimator whenever the true density is close to your suggestion; and the estimator can be superior to the ordinary kernal density estimator even when the suggestion is pretty far off. Jones and Henderson’s Gaussian copula KDE, from Kernel-Type Density Estimation on the Unit Interval (2007). This is used for data on the unit interval. 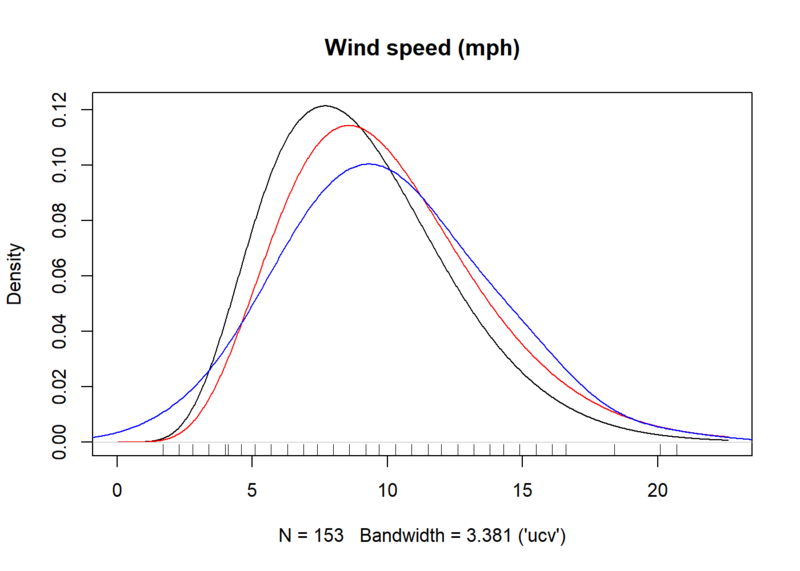 The bandwidth selection mechanism described in that paper is implemented as well. This kernel is called gcopula. Chen’s two beta kernels from Beta kernel estimators for density functions (1999). These are used for data supported on the on the unit interval, and are called beta and beta_biased. Chen’s two gamma kernels from Probability Density Function Estimation Using Gamma Kernels (2000). These are used for data supported on the positive half-line, and are called gamma and gamma_biased. These features can be combined to make asymmetric kernel densities estimators with parametric starts, see the example below. The package contains only one function, kdensity, in addition to the generics plot, points, lines, summary, and print. The function kdensity takes some data, a kernel kernel and a parametric start start. You can optionally specify the support parameter, which is used to find the normalizing constant. The following example uses the data set plots both a gamma-kernel density estimate with a gamma start (black) and the the fully parametric gamma density. The underlying parameter estimates are always maximum likelood. You can access the parameter estimates by using coef. You can also access the log likelihood (logLik), AIC and BIC of the parametric start distribution. Hjort, Nils Lid, and Ingrid K. Glad. “Nonparametric density estimation with a parametric start.” The Annals of Statistics (1995): 882-904..
Jones, M. C., and D. A. Henderson. “Miscellanea kernel-type density estimation on the unit interval.” Biometrika 94.4 (2007): 977-984..
Chen, Song Xi. “Probability density function estimation using gamma kernels.” Annals of the Institute of Statistical Mathematics 52.3 (2000): 471-480..
Chen, Song Xi. “Beta kernel estimators for density functions.” Computational Statistics & Data Analysis 31.2 (1999): 131-145.